Irish pub on rue Saint Dominique, where a lot of English is spoken. Some English speakers who are frustrated with trying to speak French in Paris go here for a break. 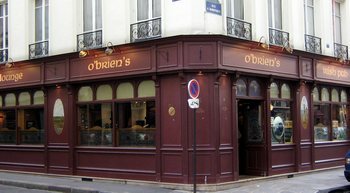 We’ve never done that sort of thing, and that’s why you don’t see Irish pubs or restos that serve American style food in Paris in my restaurant recommendations. Yesterday we went to have lunch at the temporary home of Ed and Kim, friends from Fort Myers, Florida. They are doing a “home exchange” for three weeks with a Parisian couple. Because we had to work in the morning, we took the métro there, but afterwards we walked all the way home. 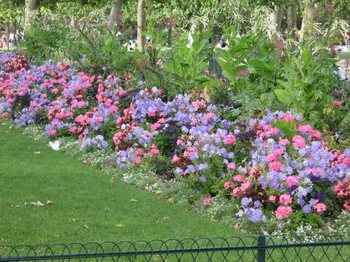 Ed and Kim’s place is in the 1st arrondissement, north of the Louvre. We had the digicode for the front door of the building, but we had a bit of trouble when we arrived because the inner door in the building was locked. Tom stayed inside in case a resident of the building came through and opened that door. I went across the street and stared up at the top two floors, where Ed and Kim are staying. Finally Ed saw me and told me which doorbell to push so that he could let us in. The experience is making me think that we really should get a mobile phone to use here. Ed told us about a very inexpensive way to get one. But today I read an article in Le Parisien about how poor the mobile phone services are here, and I’m thinking twice about it. The apartment where Ed and Kim are staying was very unusual. The owners of the apartment bought the entire building originally, and they did the renovations that turned the top two floors into one apartment. It is big by Parisian standards, but not really that big. And the layout is definitely not what you would expect. But there were many nice plants, inside and out on the balconies. There is even a private deck, full of plants, off of the master bath which has a large Jacuzzi! Now the owners have just three apartments in the building (but they own twenty-some apartments in Paris). They had an elevator installed, and it must be the smallest elevator I’ve ever seen. It is about the right size for a two-person coffin, fabricated in institutional stainless steel. The elevator had to be limited to the small space in the middle of the circular stairway, but glass would have been much better. When we left, we elected to use the stairs instead! Lunch with our friends was lovely, and we especially shared stories about using the French language and about people we’d met recently. Tomorrow our English friends, Carol and Ron, will arrive, and for several days I suspect we will be doing touristy things with them. Museums, long walks, concert in the park, etc.